Coach Greg Carvel had a sense late last season that things were getting better. 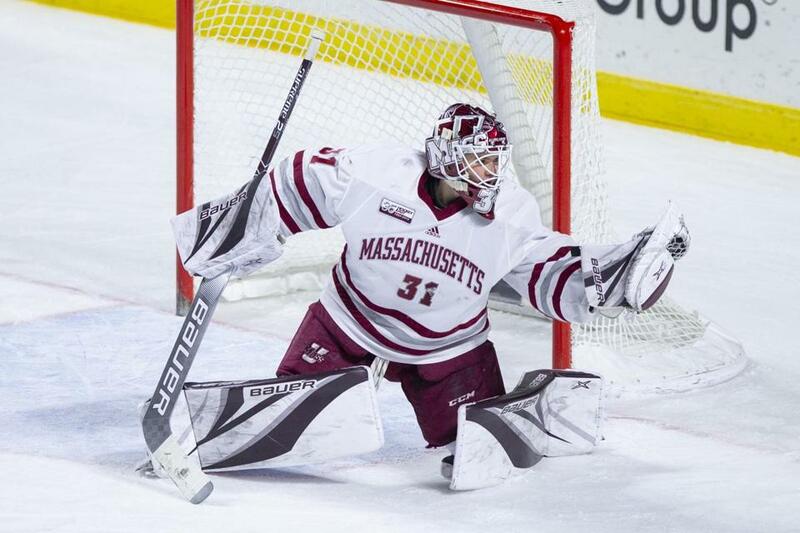 Update: On Dec. 3, UMass vaulted to the top spot in the USCHO men’s hockey poll. That a team from Hockey East sits at No. 3 in the national polls is not surprising. That the team in question is UMass, however, is. That’s where you can find the Minutemen after their 12-1 start, including 7-0 in league play. UMass beat UConn, 7-4, Friday night at Mullins Center. Not bad for a team that was picked to finish sixth out of 11 teams in the conference’s preseason coaches poll. The Minutemen are drawing from their experience of last season, when as many as a dozen freshmen were getting ice time. UMass went 4-1-1 to finish the regular season and earn home ice for the first round of the conference playoffs. After splitting a pair of overtime games with Vermont, the Minutemen routed the Catamounts in Game 3, 5-1, to win their first postseason series since 2007. UMass’s run ended in the conference quarterfinals with a sweep at the hands of a veteran Northeastern squad. The Minutemen finished the season 17-20-2. The Minutemen, ranked No. 3 last week, received 26 first-place votes in USCHO’s poll this week. There would be no easing into the schedule this year, as the Minutemen opened by sweeping a home-and-home series with Rensselaer, then traveled for a pair of games at then-No. 1 Ohio State, where they handed the Buckeyes their first loss of the season with a 6-3 win in the opener. They dropped the second game, 3-1, for their only setback thus far. It’s been quite a turnaround for UMass, which just two seasons ago finished in last place in Hockey East, winning only two conference games and five overall in Carvel’s first year in Amherst. “I came in here not knowing what was possible,” said Carvel, who was hired in 2016 after five seasons at St. Lawrence. “It’s a little bit of a leap of faith. All I did was take the formula I was using at St. Lawrence and brought it here, because it was proving to be very effective. In addition to recruiting, Carvel credits the support he and the program have received from the school. He struck it big with his first class of recruits, who are sophomores now. 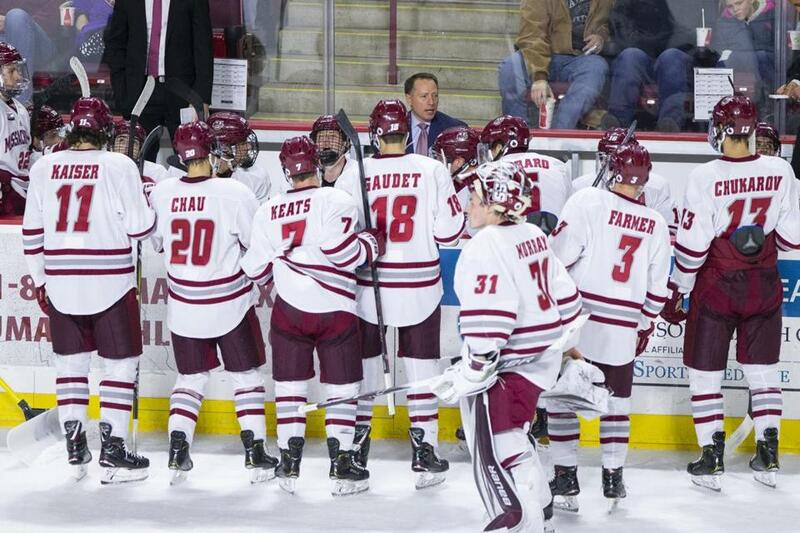 Sophomore defenseman Cale Makar celebrated a goal against Princeton last Saturday. There was a possibility that Makar might not make it to Amherst after he was selected fourth overall in the 2017 NHL Draft by the Colorado Avalanche. 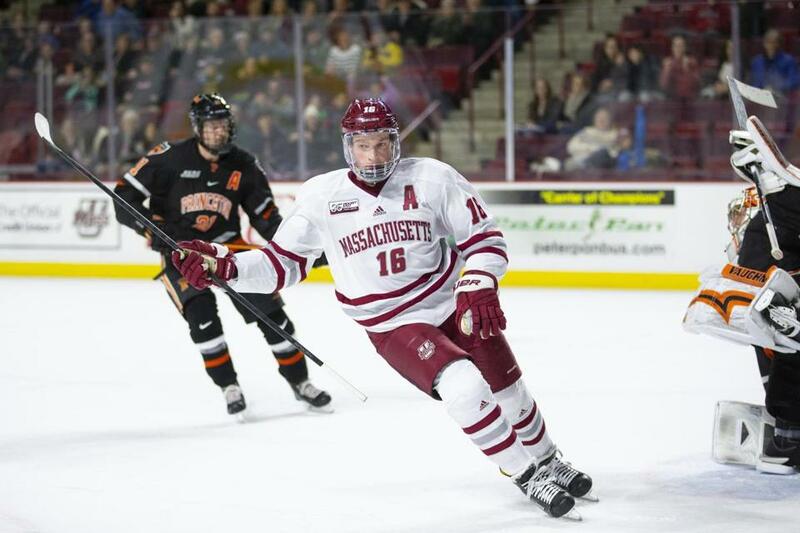 Not only did Makar make his way to UMass, he came back for his sophomore season. The defenseman from Calgary has picked up his play, tallying six goals and 12 assists. He was the conference’s Player of the Month for October. Makar and fellow blue liner Ferraro were named to the Hockey East all-rookie team last season. Ferraro, a native of King City, Ontario, was drafted by the San Jose Sharks in the second round in 2017, 49th overall. 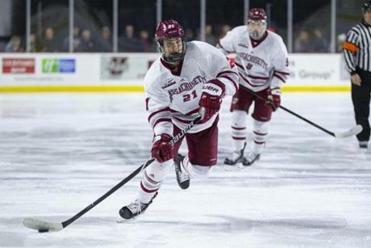 Leonard, who was born in Springfield and starred at Springfield Cathedral, led the Minutemen last season in scoring with 13 goals and 15 assists, and was also selected by the Sharks, in 2018 in the sixth round. Matt Murray improved to 8-0 after UMass defeated Princeton in overtime last Saturday. The team also has been strong between the pipes. As a freshman, Matt Murray recorded four shutouts and showed promise, but Carvel believed both the coaches and the goalies needed to be better after last season. Murray has responded with an 9-0 start and a save percentage of .936. A little healthy competition helps as well. Freshman Filip Lindberg (3-1, .936) joined the Minutemen this year. Murray was in net when the Minutemen faced Providence in a home-and-home series in early November. At the time, the Friars were ranked No. 3 in the country, yet UMass swept both games by the same score, 3-2. “Those were games, particularly the second game [at Providence], where our goaltender stole a game for us,” said Carvel. “When you play Providence, they’re such a strong team and they play the game so heavy, that it reveals your weaknesses. There’s still plenty of hockey to be played, of course. There will be home-and-home series against traditional Hockey East powers Boston College and Boston University as well as with a Northeastern squad ranked 13th in the country. Next weekend brings a pair of games against No. 9 Quinnipiac. And on Feb. 23, UMass heads to Providence for another round with the Friars. It’s understandable why Carvel doesn’t worry about his players becoming overconfident. “It’s fun to be here, but then you have to balance that there’s expectations now,” said Carvel. “You can’t sneak up on anybody.